People used to be happy? Hahah, funny story actually. Back then, taking a photo was considered to be important, like a portrait of yourself. Your descendants would see that exact picture of yourself so you had to look serious and respectable, which is why people rarely smiled. However that belief only existed in certain parts of the world, and it hadn’t reached China yet, where not everyone had cameras. 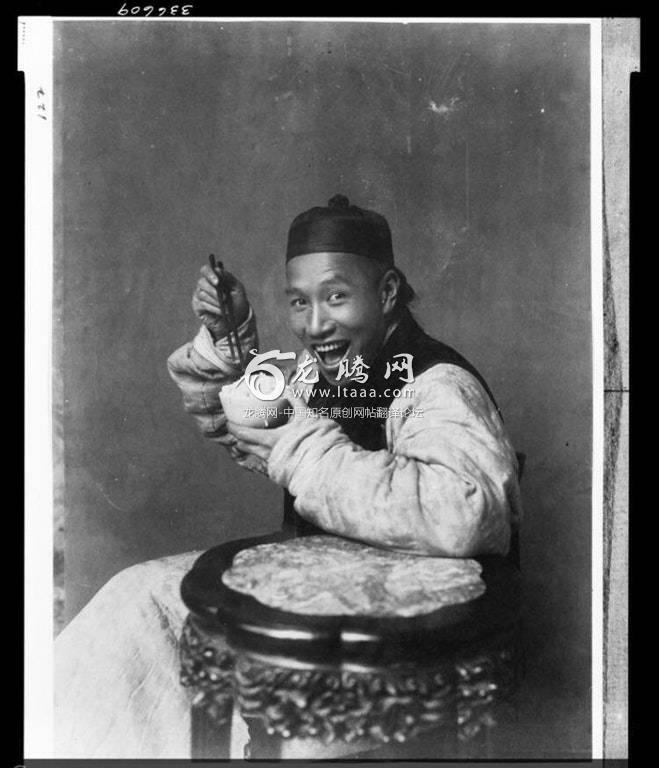 So when the British photographers came into this Chinese town and took pictures of locals they told them to “strike a pose”, and they chose to use any random pose instead of the usual serious face. Hold up op! So before film was invented, people were using daguerreotypy (more commonly known as “silver plate”) process to create pictures. Such process requires the exposure time from a few seconds up to several minutes, which requires the subject to be standing still during the exposure process. Smiling as we all know is a hard facial expression to maintain for such long period of time in addition the awkwardness that we experience, therefore people chose a more serious or relaxed expression when taking photos, and later this becomes a “tradition” in the early age of photography. When a person can admit they're misinformed with such poise, it gives me hope for the world. Not believing the 1901... Time traveller or photo shop. I agree, the photo is way too clear. Is it an apothecary table? By the 1900’s photography had advanced a lot so you’re right, except he only had to hold still for maybe a few seconds. It blows me away how many people in this thread don’t realize that photography was way more advanced in the 1900s compared to the 1800s. Assuming you had a decent camera pictures could be really good quality and you wouldn’t have to hold still for as long as you did in the 1800s. Yup film cameras have changed in size and form factor but the picture quality has changed a lot less than people would think. Digital is where a lot of the big strides have been made. True but i would still consider a few seconds a long time in terms of photography. Especially when holding a pose like that any slight movement would be a loss in sharpness. People didn't smile before the 1960s, i'm positive. People didn't have teeth before the 1960s. High quality cameras have always existed, it's just that they need special lens that are expensive. It always came down to how much the manufacturer was willing to spend on production overall. A carefully engineered high budget camera from 1880 is still gonna be better than a cheaply made camera coming from some Chinese knockoff tech company. also, his hands and fingernails aren't grubby enough. That's just because they had to sit there as still as possible for a long period of time right? It's easier to sit still with a neutral expression rather than holding a smile. Also saw somewhere that it was less common to expose your teeth back then because of poor dental hygiene but I've no idea how true that is. People in poorer, developing countries like China back then didn’t have as much access to refined sugar as developed, richer countries, so their dental hygiene wasn’t as bad.